"Mom, can we go outside?" Teeny tiny newborn puppies are adorable, heart-melting little bundles of fur you can't help but want to show off. But as much as you want to scoop them up and carry them everywhere, their immature immune systems demand they stay safe and sound with their mama for some time. Generally speaking, separating a mother and her newborn babies -- regardless of species -- is a very bad idea. When it comes to your pooch and her new brood, she is essentially all they need for the first four weeks of life. The little pups are born blind and deaf, and can barely move except to squirm about to nurse. They also cannot maintain their own body temperature, and snuggling with Mama keeps them warm and toasty. All puppies should primarily stay with Mama during these first weeks, but you can snuggle with them periodically if Mama seems cool with it. In those early newborn days, Mama encourages her little ones to go potty by licking their nether-regions. By the time the pups are about four weeks old, they should start going on their own, without Mom's tongue for encouragement. You can start house training the little ones at this time by taking them outside to do their duty on a regular basis. Puppy bladders aren't very large, so you'll be going in and out often as they start to gain control of that particular body function. Keep these trips outside short, as the antibodies the pups received in their Mama's milk may help keep them healthy and disease-free, but it's not fool-proof. The pups' immature immune systems still leave them susceptible to all sorts of illness from the outside world. 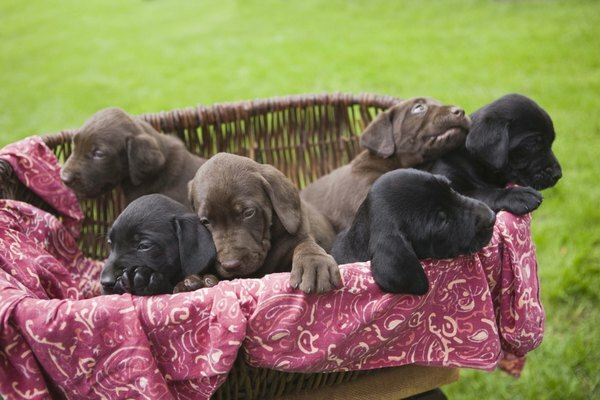 Your puppies won't be shut-ins all their lives, and by the time they are six weeks old, they can start visiting the vet for their vaccinations. Most pups wean from Mom at around four weeks old, meaning they lose those important antibodies found in Mama's milk. Science takes over soon after, and your vet will recommend a vaccination schedule to protect your little ones as their immune systems strengthen. By the time the pups are 12 weeks old, they should have the green light to head out to the park and socialize with other furry friends, without fear of spreading or contracting illnesses. That first round of vaccinations isn't the last your puppies will see of the vet. Regular booster shots keep the little ones protected throughout their lives, with schedules ranging from once a year to once every three years depending on the specific vaccine. In addition to these regular shots, your pups will also need constant protection from worms, fleas and other nasty parasites that live on or in your puppy and cause health issues.